Training program for elementary school teachers in Chimoio, Gaza, Tete and Nhamatanda. 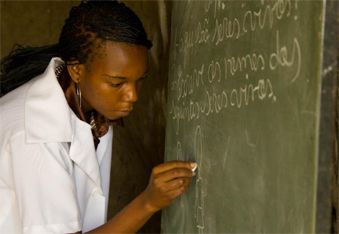 A total of 642 teachers for Chimoio centers (160), Gaza (195), Tete (137) and Nhamantanda (150) graduated in 2011. The value of these schools is, also, in its multiplier effect, since there are thousands of elementary school students who attend classes in the framework of practices that takes place during the two year duration of the training period for teachers. In fact, the direct and continuous contact with students allows teachers define better future educational programs, fully adapted to the reality of primary schools in the area. Gain flexibility and experience, which makes them better teachers.